Financial allocations have not been made in the Budget 2019 to fund the expenses of the Sri Lankan athletes who are scheduled to participate in the 13th South Asian Games scheduled to be held in Kathmandu and Pokhara, Nepal next December, it is reported. 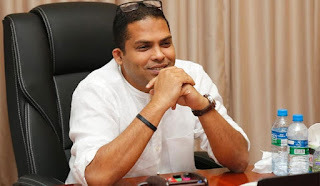 Therefore, Sports Minister Harin Fernando will have to submit a special expenditure estimate, it is said. The Finance Ministry had instructed the Sports Minister to submit a special expenditure estimate for this purpose. According to the Appropriation Bill presented to parliament, less than Rs. 4000 million has been allocated to the Sports Ministry, while last year Rs. 5,425 million had been allocated. This year Rs. 6,335 million has been allocated for three Ministries, Sports, Foreign Employment and Telecommunication. According to analysts, as this sum has to be divided between three ministries, the allocation for the Sports Ministry is inadequate. If the South Asian Games will be held in Nepal as scheduled, around 600 Sri Lankan sportsmen and women are expected to participate. It has been estimated that the Sports Ministry would have to bear a cost of around Rs. 300 million for this tour. It is roughly around Rs. 400,000 per athlete. Last year the South Asian Games were held in Guwahati and Shillong, India and Sri Lankan Airlines had allocated two aircrafts to transport the Sri Lankan athletes. According to Sports Ministry sources, this year too they would have to allocate two aircrafts for the Sri Lankan contingent. However, around 175 officials are ready to attend the South Asian Games this year.